It's an all-new Star Wars galaxy and an exciting new era of connected storytelling. 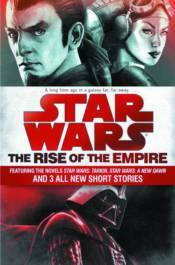 This special trade bundle featuring two full novels, along with new original short fiction provides a great starting point for the journey to Star Wars: The Force Awakens. In John Jackson Miller's A New Dawn, the stage is set for the coming Rebellion against the Empire. A Jedi survivor of Order 66, Kanan makes a living as a freelance pilot, keeping his head down to avoid any Imperial attention. In James Luceno's Tarkin, the engaging story of Grand Moff Tarkin, the man who built the Death Star and could command Darth Vader, is revealed.